Front and back: Once our customers start considering their options with our mens custom shirts, they realize how many variables go into the design. What kind of front placket or back pleats appeal to you? Services once available only to the well-traveled, high-profile executive who could visit the best mens tailor in Hong Kong are now available to you, close to home and at affordable prices. 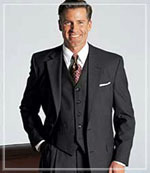 See "Styles & Prices" and select the category for custom tailored mens suits to get an immediate rundown of your options and a straightforward price. If you are interested in meeting with one of our master tailors in a city near you, please take a moment to view the travel schedule. We're based in Austin, Texas, but we travel throughout the United States year round. If you would like to find out more about your options for custom tailored mens suits, you may also contact us at our toll free number or complete the contact questionnaire found on the "Contact Us" page. We also respond promptly to emails and faxed inquiries.